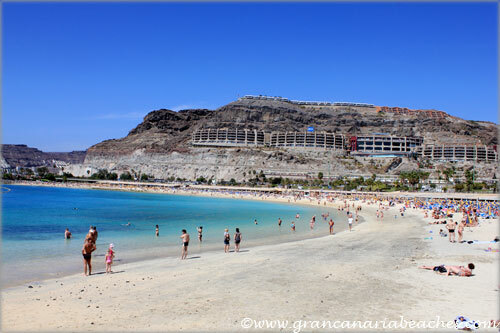 Playa de Amadores or Amadores beach is a lovely beach located in the south of the island of Gran Canaria in the municipality of Mogan. 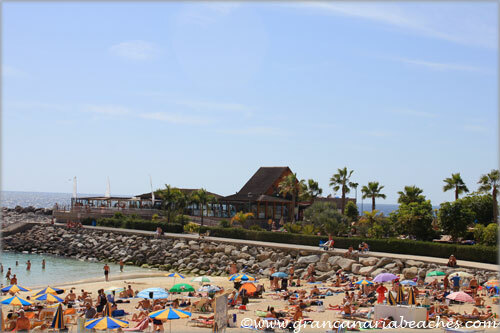 It is the third man-made beach of the island, and it is very well designed and built. There are a couple of hotels built right in the cliff, overlooking this beach, so if you want to wake up in the morning with a beautiful view, this could be your choice. For those arriving by car, it has an underground parking area. There is a bus stop right next to this beach, as well as a taxi stand. As it is located on the southwestern side of the island, it is protected from the North Atlantic currents. Besides that, there are long artificial breakwaters that protect the swimmers from strong waves. 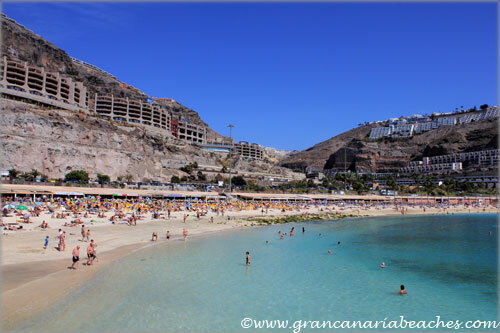 The sand of Amadores beach is white. 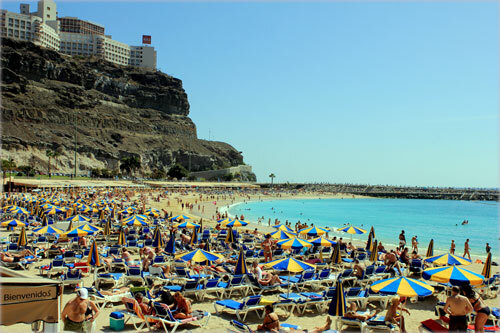 The reflection of sunlight on it doubles its effect on the skin of users so it is advisable to use sunscreen to enjoy a fantastic day at the beach. The shoreline of beach is 800 meters long by 30 meters wide. The contrast with the white sand makes the water look turquoise blue, as if the beach was located in the Caribbean. 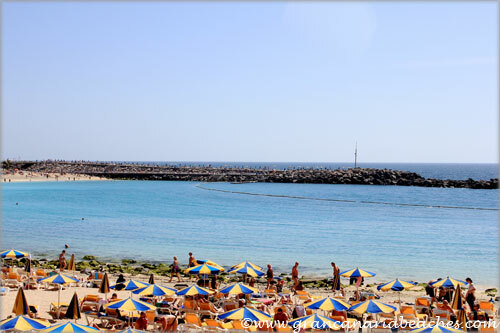 Like almost all beaches on the island, Amadores has a beautiful promenade that has become the meeting point of sports and romantic people. During the day, the locals and tourists practice all kinds of sports, like jogging, along the promenade. This beach’s facilities are well equipped and made. It has showers on the beach itself, and proper public bathrooms where you can change your clothes, etc. A small fee of 0.50 Euros is charged. All along the promenade you can see plenty of shops selling typical products, water bottles, drinks, and ice cream. There are also many restaurants with the best local and international cuisine, and entertainment spots where you can sip a drink while you fall in love sharing a splendid sunset. 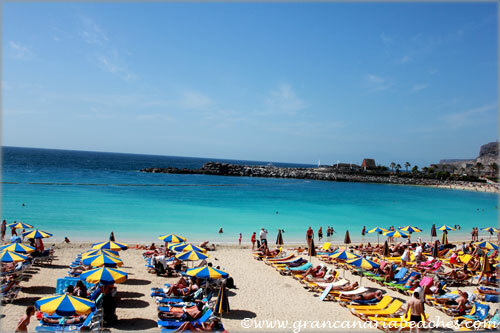 You can rent parasols and loungers on this beach for 3 euros each, for the whole day. 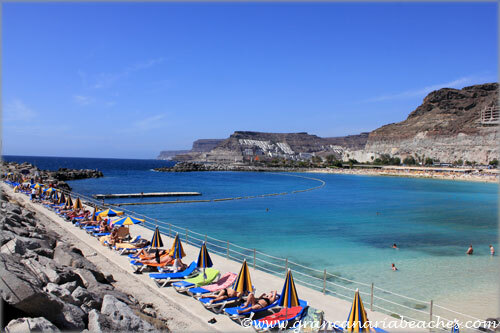 Amadores is cleaned daily at night by the town hall workers, as there is hardly any tourist activity after 11.00 p.m.
Another thing to keep in mind is that this beach gets busy on weekends as many local Gran Canarians go and spend the day there. Also, during the summer months of July and August, and part of September, it is quite busy. If looking for a place to combine sun, sand, sea, romance, sports with the best services, Amadores beach is your personal paradise. 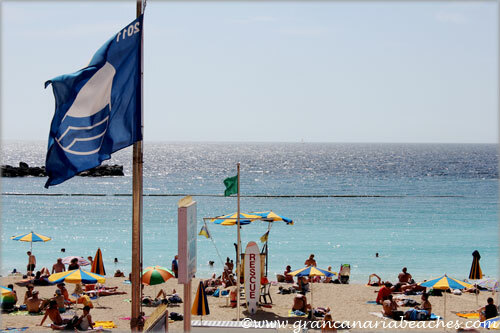 Indeed, the water here is crystal clear, and that is why the authorities have again awarded this beach with the 2014 blue flag.